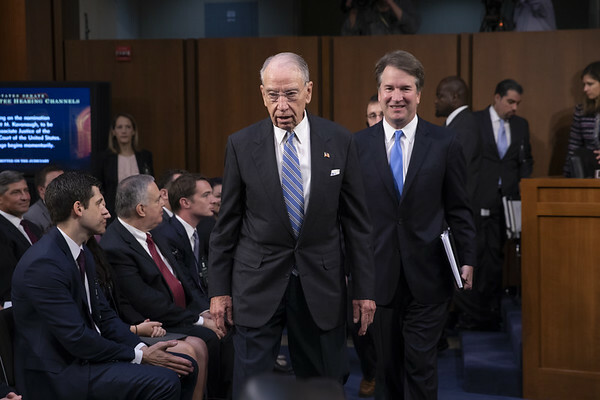 WASHINGTON - Supreme Court nominee Brett Kavanaugh repeatedly stressed the importance of judicial independence on the second day of his confirmation hearing Wednesday as he faced questioning from senators, including Democrats who fear he would be President Donald Trump’s man on the high court. But he declined to address whether Trump could be subpoenaed or could pardon himself. Kavanaugh also refused to say whether he thinks a president can pardon himself -- or provide a pardon in exchange for a bribe or pardon someone on the understanding that the person wouldn’t testify against the president. Day two of Kavanaugh’s confirmation hearings began much as the first with protesters often interrupting proceedings. More than a dozen protesters hauled out of the hearing room shouting objections to Kavanaugh’s nomination. Posted in New Britain Herald, Nation-World on Wednesday, 5 September 2018 18:01. Updated: Wednesday, 5 September 2018 18:03.